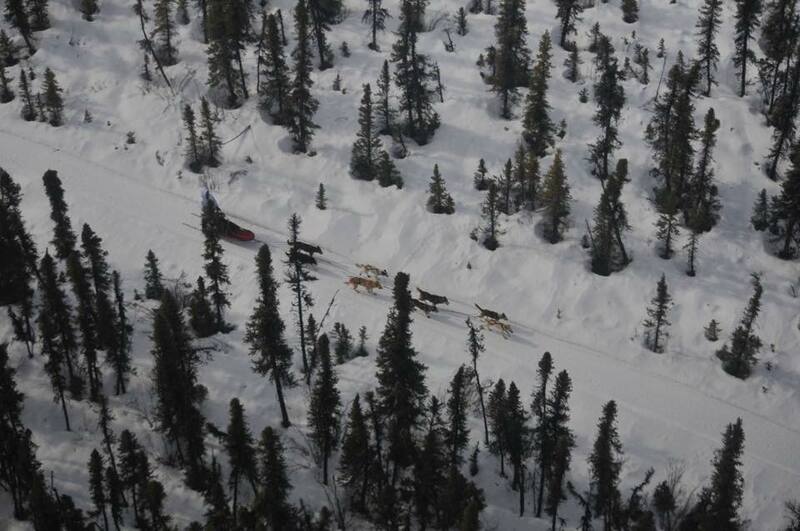 Our first race of the year was the Earl Norris Memorial Sled Dog Race that is part of the Willow Winter Carnival. It is a 30/30 race meaning you run thirty miles one day and then do the same trail the next day. 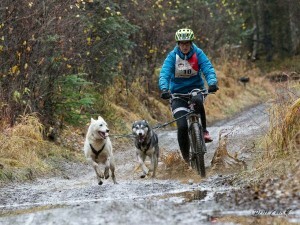 We decided to enter two eight dog teams with me (Robert) and Lacie running in the event. It would be Lacie’s first race. She has been training with us all winter and has hopes of running a team in a few more shorter races this season. Sign-ups were held after the carnival kick-off dinner at 6:30 with the starting order draw to follow. I would be going out 10th and Lacie would be going out 13th. There were 15 teams entered. We headed home, picked the teams and loaded up all the gear. 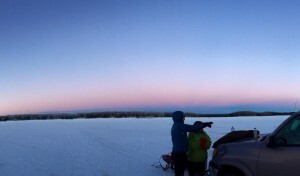 We got an early start and headed over to Willow Lake with 16 dogs in tow. The race called for 10 dog teams so we already knew we would be a bit slower than most of the other teams along with them being sprint teams as well. 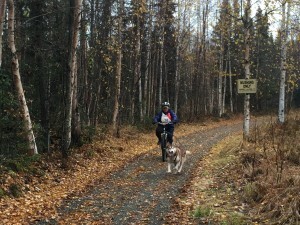 We ended up parking together as a few mushers didn’t show and soon realized that starting would be a little chaotic. All the teams were hooked up and yelling to go by 10:00. I should be going out at 10:20 but several teams had to be shuffled for the no-shows. 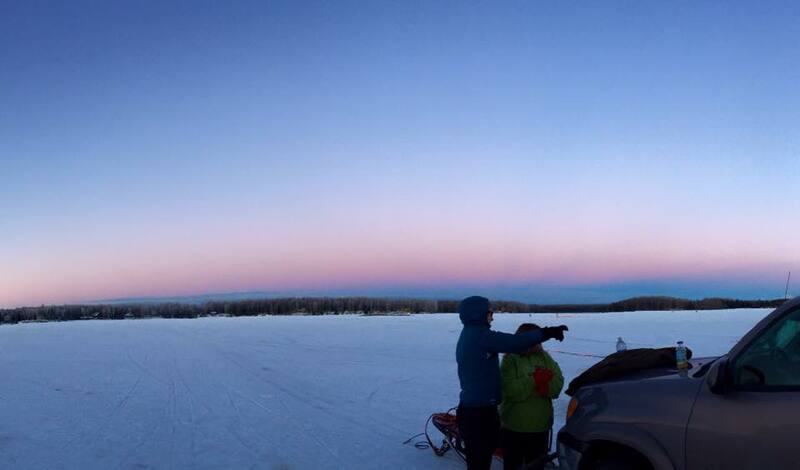 Very quickly a couple mushers went the wrong way across the lake and one musher lost his team. Two snow-machiners blasted off like rockets across the lake to catch the speedy, driverless team. Our friend, Kari got turned around a bit on the lake too but managed to quickly find the trail. As my time to leave was coming up the timers skipped over me and went to bib 11. It caused a bit of chaos because we were supposed to have two spots between me and Lacie. By the time I was off, Michele and Vanessa were hurriedly trying to get her team on the line in less than two minutes and she incurred a penalty. My dogs found the trail across the lake quickly and soon we were on our way. The first section of trails were on again, off again on the lakes before our first road crossing and then into the trees. I planned on keeping my dogs under 11 miles per hour this soon in the race but they wanted to go. By the time we made it to the long, wide road I started having problems with my leaders. Sidney is getting older and she is slowing down so I stopped and quickly changed out her with Mila in lead. This was her first time as a lead dog in a race and she wasn’t sure what she was supposed to do. We were quickly passed by a few speedy teams on the road before we got to the Lucky Shot Trail. The trails were beautiful! The snow was just coming up and a fog was lifting. We were making our way around Almond Lake on our way to the swamp and suddenly a long patch of ice appeared. Almost at once I saw both my wheel dogs, Bodhi and Raegan slip and try to catch their footing. Shortly after we arrived at the Willow Swamp Loop I knew something was wrong. Both Bodhi and Raegan were hobbling and I stopped and set my hook. 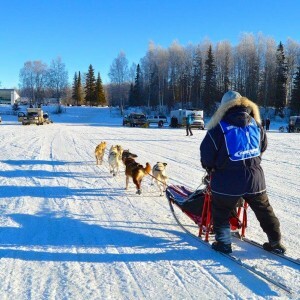 It looked like the little slip on the ice took them both out and suddenly I had two dog in my sled bag with more than half of the race to go. Bodhi settled in soon in his comfortable spot but Raegan didn’t want any part of it. She was telling me about it too in her husky whine. I now had a six dog team and pretty quickly Lacie caught up with me. We spent the rest of the Swamp Loop in tandem. Her team not wanting to pass mine. After crossing Vera Lake and the road crossing near Eaglequest Lodge, Mila had enough. I made a decision to put Burton in lead. This was his first time too. We made our way back to the Lucky Shot and the road. It was now a long, slow up hill for almost two miles. Just as we entered the trees Bodhi was ready to get back on the line. It didn’t last long as he knew very quickly his shoulder was hurt and quickly stopped after we crossed the final road crossing just two miles from the finish. A couple volunteers asked if I needed assistance and said they could take him but I would probably be disqualified for outside assistance. I politely declined and loaded him back in the sled bag with Raegan. I hadn’t seen Lacie and her team since the bottom of the Lucky Shot Trail and I hoped she would be okay. There was a four hour cut off time limit and I was cutting it close with all the problems I had on the trail. I pulled into the finish with a time of 3:45. Lacie didn’t make the cut off and would not be allowed to race the next day. To put things into perspective, I ran this race last year with two days of running at three hours a piece. Today I was 45 minutes slower and over and hour and a half slower than the first place finisher. We unhooked the team and gave them all a frozen chicken thigh while we waited for Lacie to come in. After the race we headed inside to grab lunch and head home. Since I was the last to finish on Saturday I was the first team to go out today. I didn’t mind as I knew I would be passed quickly by the speedier teams coming up behind me. I started with Sidney again in lead and this time she and Frosty did veer a little to the left off the trail. I quickly called out, ‘Gee!” and got them back on track. By the time we were in the trees after the first road crossing I changed out Sid with Burton. The run today was much faster even though I only had a six dog team. We decided to leave Bodhi and Raegan at home and run with the smaller team. I knew at this point I would be in last place but still “in the money” so to speak as long as I completed the race under the time cut off. That was no problem. I did end up coming in last place and finished in ninth place, the same place as last year. The difference was last year there were a few teams that finished after me. This year they were either scratches, no-shows, or DQ’s. I collected a small check that covered my entry fees and we headed home. We knew going in that training was not up to par to what we expect and what we usually do so we knew we would do poorly. It was nothing put lack quality training that caused us to come in last and required Lacie to not finish under the time limit. My dogs did great with what we had to work with and did very well carrying two dogs in the sled bag that added at least a hundred pounds or more to the sled. I was a little worried about being able to finish with just a six dog team and lack of strong leaders. I know that a lead dog will make or break a team and I saw that Sidney just isn’t able to run as fast as the others at the excited start of a race anymore. She always does just fine in team and her gait is impeccable. This is always a fun race and the trails are superbly groomed. The Willow Trails Committee puts in so many hours and their hard work is second to none. I always enjoy running on trails close to home and being a part of the Willow Winter Carnival is always an added bonus. We will be back every year as long as it fits in our schedule. 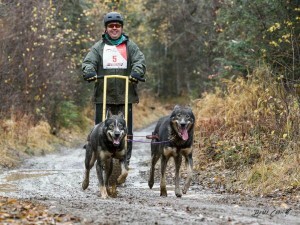 I am always honored to support local events and take part in a race that pays respect to a mushing legend, Earl Norris. 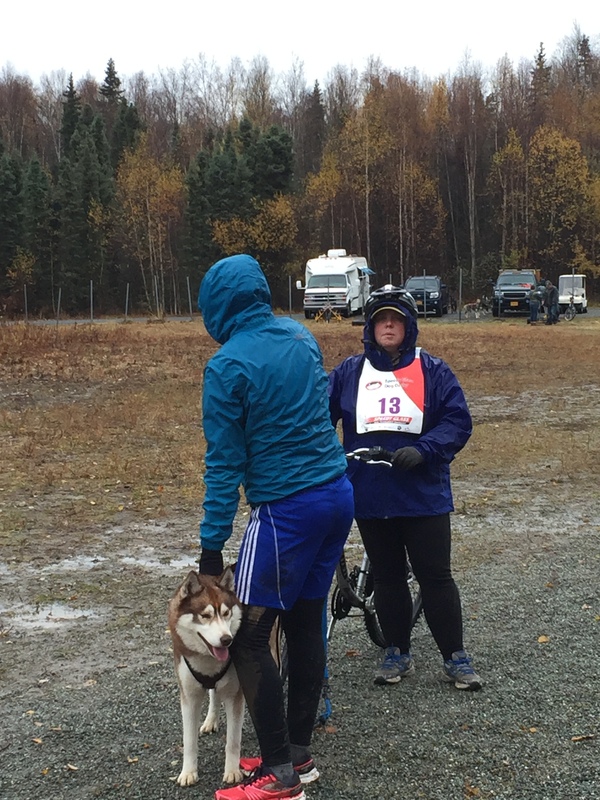 This past weekend we arrived at our first event of the year at the preliminary dryland races at Chugiak Dog Musher’s Association trails in mass! We were racing in all of the events and entered teams in nine of them. It is a great thing to have dryland events in Alaska. If it was not for all of the hard work of Debora Summers for all of her hard work none of this would be possible. We were proud to be sponsors of the second weekend of these races, with Alaska Dog Works donating to the trophy fund. We started training early this fall for these races. We knew going in that we wanted to try a bunch of the up-and-coming stars of the kennel in these low-key events to give them experience and build confidence on the trail and all important social skills around lots of dogs and people. 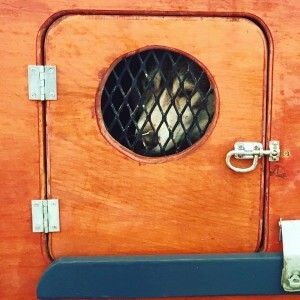 In the weeks leading up to the races we ran our newest addition to the team, Mila, who arrived this summer from our friend Zoya, as well as Atreyu and Aryun the brother and sister duo from The Oracle Crew. We ran a bunch of dogs in lead including Bodhi, Burton, Aussie and others. Our friend Lacie trained hard with her pup, Boomer, in canicross down in the city. 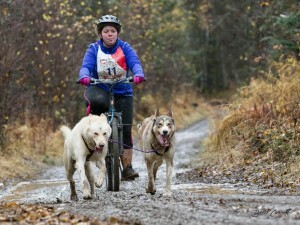 Nicole and Lacie competed in the canicross events. They both did great! Nicole ran with her German Shepherd Qyain and Lacie with her dog, Boomer. Lacie ended up finishing in 3rd place overall. In the biker class, Nicole and Michele ran. There was a bit of a mix up with the way that ISDRA rules were used. Unfortunately, we were only allowed to use each dog only in one event. That put a damper in our plans but we made it work! 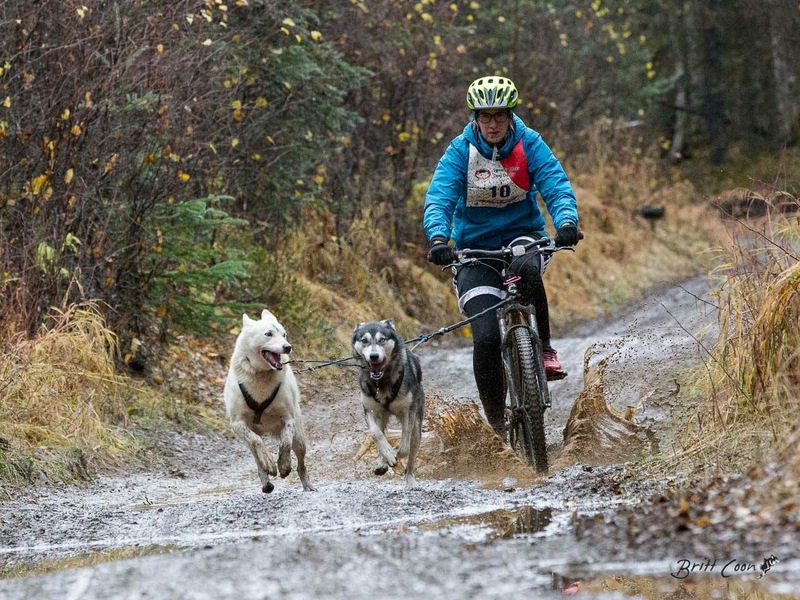 The two-dog biker was our biggest showing! At the time of sign-ups we had four teams and 8 dogs listed in the event, but with the sudden rule changes, Robert dropped out to leave Lacie, Michele and Nicole to run. Robert tested out the big tires of the scooter for the event. It was the first time in his life he had ever run a race with a scooter. It made for slow but good times with the sloppy, rainy and muddy conditions. Robert ran the old Risdon-style Frank Hall made, cart that he has had for more than a decade and a half. 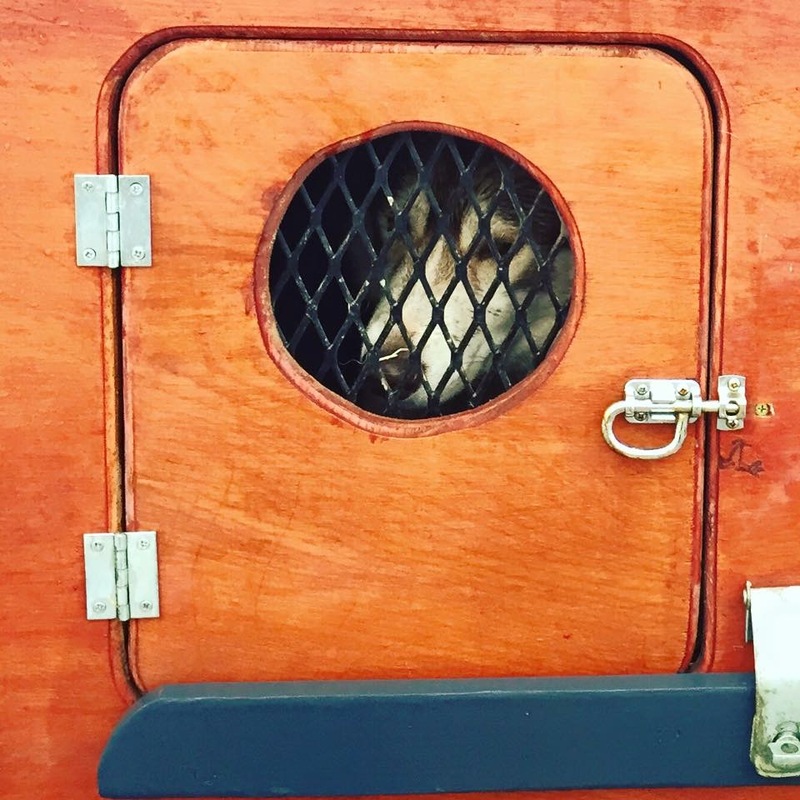 He used to train 12 dogs at a time on this cart when he lived in Colorado with Michele chasing him in the mini-van with three little kids in tow. The wheel-barrow style wheels didn’t work too good on the sloppy trails and Robert ended up in last place but still had a blast. All in all we had a great time! 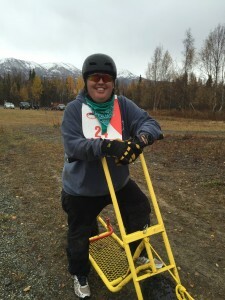 We were so glad to be a part of the first ever ISDRA sanctioned dryland races in Alaska. We want to thank Chugiak Dog Mushers Association for all their hard work in getting this event going. 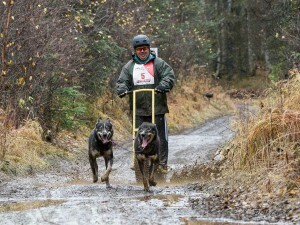 We were happy to have won some cash and prizes and thought our slow long distance dogs did pretty good against the speedy sprint dogs on the trails. Last year we heard about a race from our friend Dan that we knew this year we would have to put on the schedule to attend. It was the Tolsona 50/50. 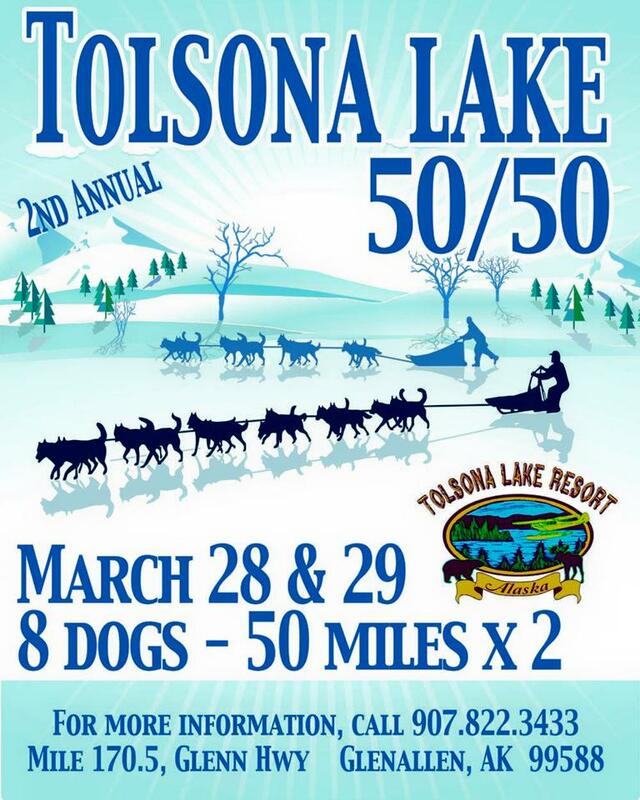 The Tolsona Lake Resort is on mile 170 of the Glen Highway, a couple hundred miles from home. 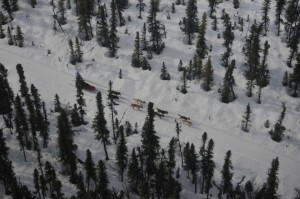 It is one of the checkpoints on the Copper Basin 300 and from what we heard a great place to run dogs. We were scheduled to take part in the Willow Relay Race with our teams on this weekend but with the rapidly melting snow in Willow and the un-seasonably warm temperatures we made other plans. The Sunday before the race we decided we would enter two teams. Robert (me) and Tyler would run together. Tyler hasn’t ran in a race in two years and it would be good to get him back on the runners and spend some time on the trails with me. We called Crystal at the lodge, made a room reservation and told her we would be there with two teams in tow. We packed up the truck with gear, sleds, and dogs and hit the road about noon. Michele would have to stay behind to take care of the remaining dogs and she had several dog training client meetings over the weekend. She would be the designated social media liaison during the race. I would be running: Frosty-Shock, Bodhi-Raegan, Shifter-Gabby, Spencer-Aussie. We made it over the rivers, mountains and through the woods in good time and arrived to the lodge at about 4pm. We checked in, dropped the dogs and fed them dinner before heading over to the lodge eat dinner. We spend the evening talking with Dan and his family and playing pool. Nicole had never played before so we tried our best to teach her the new game. The mushers meeting started at 9am and we drew our starting positions. Tyler would be going out second, behind our friend Karen and I would be going out six minutes later in lucky number 5. Running a small eight dog team it is easy to get things ready to go and it being a shorter race we only had a few pieces of mandatory gear. We were required to pick two of the following: parka, sleeping bag, axe, tree saw, cooker and fuel, or snowshoes. I took the lightest of the group and packed the axe and saw. Same with Tyler. 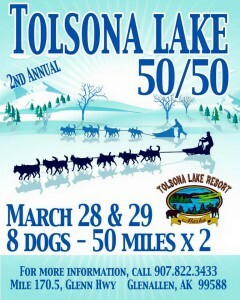 As the start approached we bootied up a few of the dogs and hooked up Tyler’s team and the countdown begun. With only ten teams entered, we would all be on the trail in short order. Karen pulled her hook and was on her way. Then the fun began! Tyler pulled his hook and immediately the sled tipped over. The dogs took off like a rocket toward the chute with Tyler being drug down the lake. Several people started to run after him including Nicole with the big Canon camera around her neck. Tyler managed to finally right the sled and was on his way. While it was only a few seconds the whole thing seemed to be going on in slow motion. As he got back on the runners the people watching cheered and Nicole had to run back to help me with my team as I only had six minutes before I was supposed to leave. Out of breath, Nicole managed to get my team on the line with a minute to spare and I was on the trail on time. The race would be 50 miles each day with Sunday’s heat running in the reverse direction. The teams would also be starting in reverse order. Meaning the last team to finish on Saturday would be the first team to start on Sunday. We were on Tolsona Lake for just over a mile before we made a sharp gee (left) turn into the woods and down a hill towards the creek. We were told that the creek had some open water and if we wanted we could make a sharp left turn and go over the bridge but a tree might be in the way. Our dogs are used to running through a lot of open water during the rainy fall training season so we skipped across the creek soaking my Neo’s (boots) up to my calves. There was a bit of glaciation as we made our way to the very wide trail. 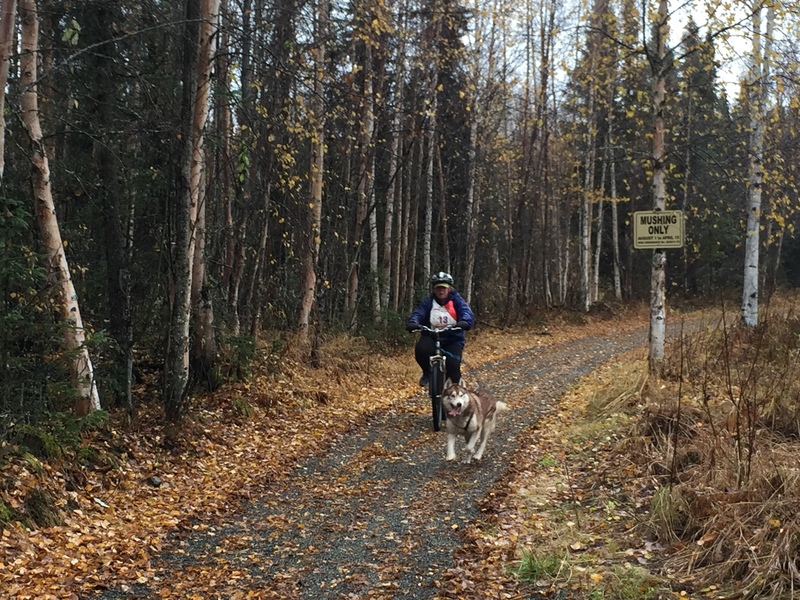 The trail for the next 10 miles or so was as big as a two-lane road and is much used by snow machines and freighting gear to the cabins along the lakes. Teams started passing each other as we made our way down the trail. At mile 8 I saw Tyler pulled over and changing out leaders. I yelled out. “are you okay?” and he said his shoulder was hurting real bad from the fall. At mile 13 we made a sharp haw (right) turn and the trail crew was there taking pictures and recording times. I was in ninth place at that point with only Tyler behind me. We made our way through a winding wooded trail for several miles before coming to Crosswinds Lake. It is huge! We were on the lake for three or four miles and the trail was getting a little soft in the afternoon sun. As soon as we got off the lake we started up hill. The next twenty or so miles would be up and down, up and down. It as getting really warm and the dogs slowed down to about seven miles per hour. At about mile 30 I switched Shock out with Aussie in lead. I could see Dakota’s bright orange jacket in the distance so I knew I wasn’t too far behind the next team. After all the hills we made a sharp left turn away from Lake Louise and headed back toward the intersection. As I approached the trail crew still there taking pictures and recording times I asked them how I was doing. They said I was about 30 minutes behind Dakota. We were back on the wide trail and 13 miles from the finish and Reagan was slowing way down and dipping snow. I stopped the team and loaded her up in the bag on the sled. She didn’t want to go willingly but she finally settled down and we made our way back to the creek. We flew through the water and up the hill toward the finish line. I ski-poled a lot during this race and my arms were burning as we got closer to the truck. We finished strong and I checked in with Greg, one of the race crew, on how we did. He thought we looked good. About the time Nicole and I were done snacking the dogs and putting them back in the truck Tyler came in with his hand in his pocket supporting his sore shoulder. Once we got his team snacked and unhooked we could tell he was in a lot of pain. His shoulder was dislocated and I helped him get it back in place using the hood of my truck. He screamed in pain! He then pulled up his sleeve and had a huge ice rash up and down his arm that bled through his sweatshirt. He ran 50 miles with a dislocated shoulder. That’s a musher for ya! We finished our chores and headed up to the lodge for a most excellent Prime Rib dinner before getting back to the room and retiring for the night. Tyler decided that he wouldn’t be running the second day with his hurt shoulder and the fact that one of his leaders, Vela, was just too slow in the heat of the day to be effective on the team. The Race Marshal said we could trade out mushers, and have Nicole run, or let me use some of Tyler’s team on mine. I didn’t think it was right to change the rules up for us so I declined. I decided to start with seven dogs, leaving Reagan off the team. There was no reason to push them too hard as this was mainly just a fun training run for us all. We started the day off in reverse order. I was heading out first now that Tyler was out of the race. I was followed by Dakota and Karen. Shortly before the creek Dakota passed me. When we got to the creek it was fully open by then and Dakota had to wade through knee deep water to get his dogs across. As we were waiting for him to do that Karen decided to take the bridge and got her team tangled in the tree. She recovered nicely as I passed her by on the slick icy trail. I asked her if everything was okay and let her pass me a mile or so down trail. By the time we were at the turn off all the teams had passed me and I was comfortably at the back of the pack. I knew the next 37 miles or so would just be me and my team on the trail and I settled in for the hills. I turned on my iPod and started listening to a mix of Godsmack and Rob Zombie, my trail favorites and slammed at 5-Hour Energy shot. The hills weren’t nearly as bad on day two as we were going in the opposite direction. It was much more decent than ascent. We were averaging about 9.8 miles per hour when we reached Crosswinds Lake. I stopped the team and let them have a quick five minute break and switched Shock next to Bodhi which was an open spot on the line since I left Raegan at the truck. Now Frosty was in single lead. We ran across the lake and through the wooded trail to the intersection. I saw the trail crew and asked how I was doing. It was about the same as the day before. I ski-poled a good portion of the wide trail and was making decent time even though we slowed down to about 8.5 miles per hour. We crossed the creek which was even deeper now and the sun was still warm. I look off my wind-shirt and headed toward lake and the finish. It was almost 3 pm when I finished and we were just in time for the banquet. I rushed to the room, packed up our gear and changed clothes. We were back on the road and home by 7:30. As I always do on my race recaps I list what we learned during the event. I do this to hopefully learn from our mistakes and to show our rabid fans things we see and do along the trail. I am a firm believer that we all can learn from each other and this is as good of a way as any to do so. We have always been a team that runs the best at night. With our training schedules worked around our jobs and schools almost all of our runs are made when it is cool and dark. This hurts us every time on races and has cost me to scratch on a few occasions. I have said over and over this is our weak link. I am unsure how to fix this. We don’t have the luxury of not having to work or go to school. Another one of our big problems always has been the lack of hill training. 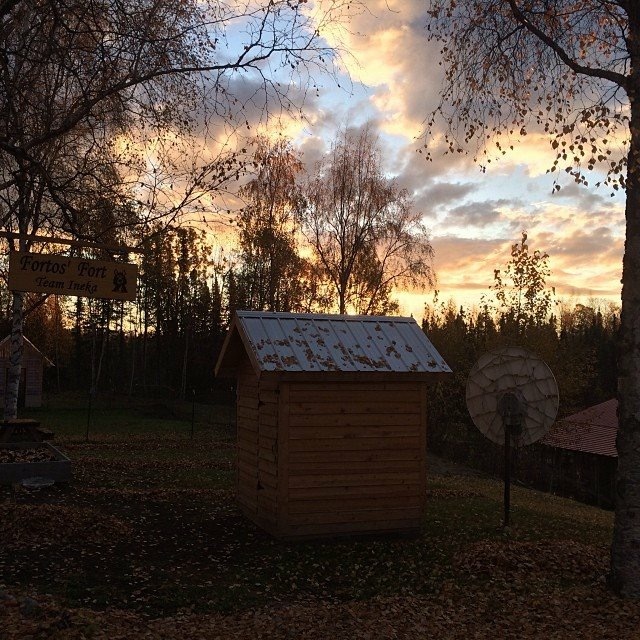 Living in Willow it is relatively flat and the trails are winding wooded trails and over lakes. While Nicole had a great experience during the Junior Iditarod with all the hills of the Denali Highway we just didn’t have enough of this type of training this year to make a difference. I thought overall my dog team did very well. Even though it was hot, all of them were eager to run and wanted to finish. Vela is the slowest of all of our leaders. While I have known this since our Tustumena Experience a few years ago, we just haven’t had great success with training up and coming leaders, except for Shock, to fill that roll. That is a major training goal for this coming off season. 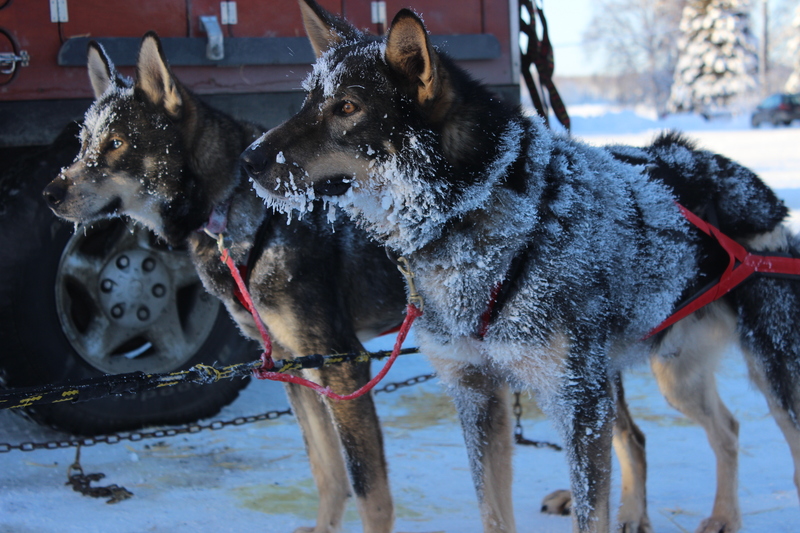 One of my proudest moments was when an Iditarod musher who was parked beside us said, your dogs eat like robots! That is great! I wish our dogs ate like that! 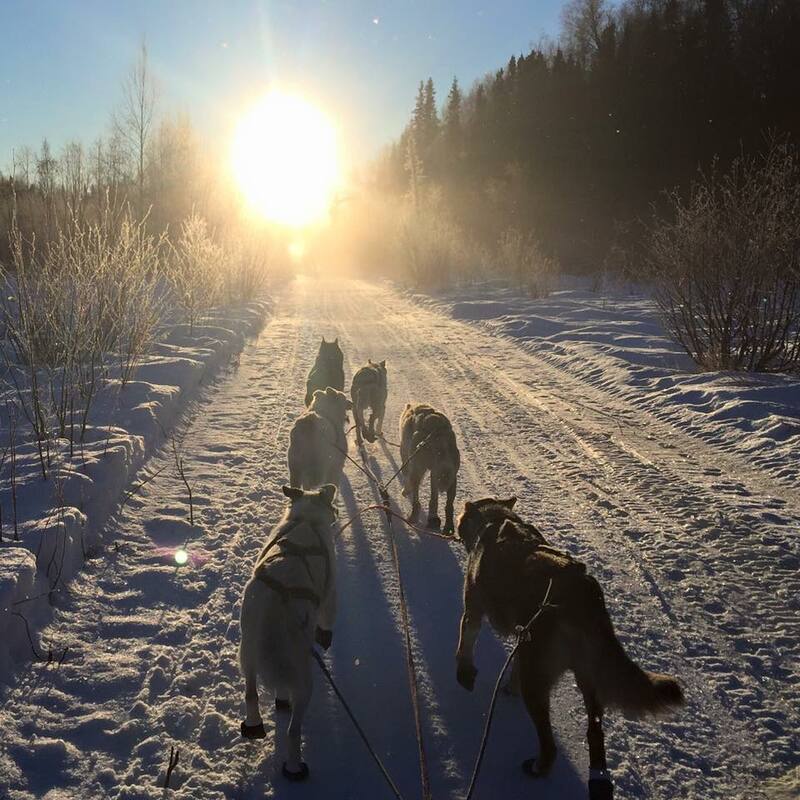 This is great to hear from another musher. One of the things you must train for is for your dog team to eat heartedly and mightily on trail. This little thing can make or break a dog team and the success or failure on the trail. Never let go of the sled! This is the number one rule in mushing and Tyler did great! He managed to get the sled back on the runners while the team was running as fast as they could at the start of the race. We have taught this rule to our kids since the first day they were on a sled and Tyler did a remarkable job in controlling his team. Use the ski pole more. I really enjoyed using my ski pole during this race and this was the first time that I have ever used it for many miles. Next year I plan to use two ski poles in training and in races. Speed. I have no idea what I need to do to get our team to go faster. Looking over the training logs for the entire season using the Suunto Ambit2 it shows we are a consistent 8/9 miles per hour. While this is a decent pace for a long distance team we were half as slow as the winner of this race who was racing at over 14 miles per hour! 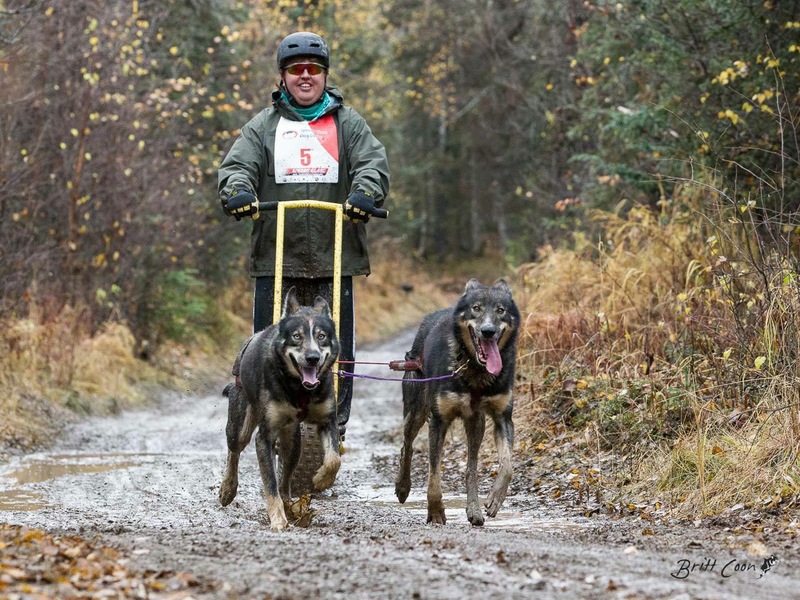 I am sure it is a variety of factors including genetics, older dogs in our team who are used to and Iditarod/Yukon Quest pace and they are training the younger dogs to run slower. 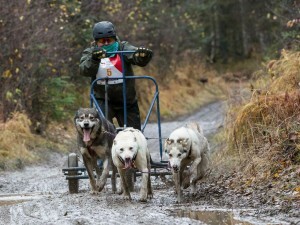 Frosty is one awesome little sled dog! Frosty has ran in every race and most of the training runs this season. He came to us in the fall from our friend Hugh as a leader prospect and Nicole did a great job working with him. 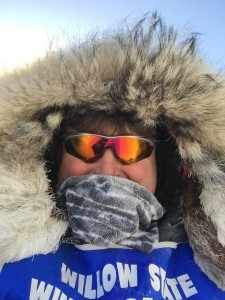 Just in the month of March he finished the Junior Iditarod, 800 miles of the Iditarod trail with Hugh and this race in single lead. Being only three years old he is the future of our team in lead along with Lock, Shock, Barrel and Burton. It is always fun to run these types of races among friends. I knew just about everyone we raced with and spent a while talking with each one. 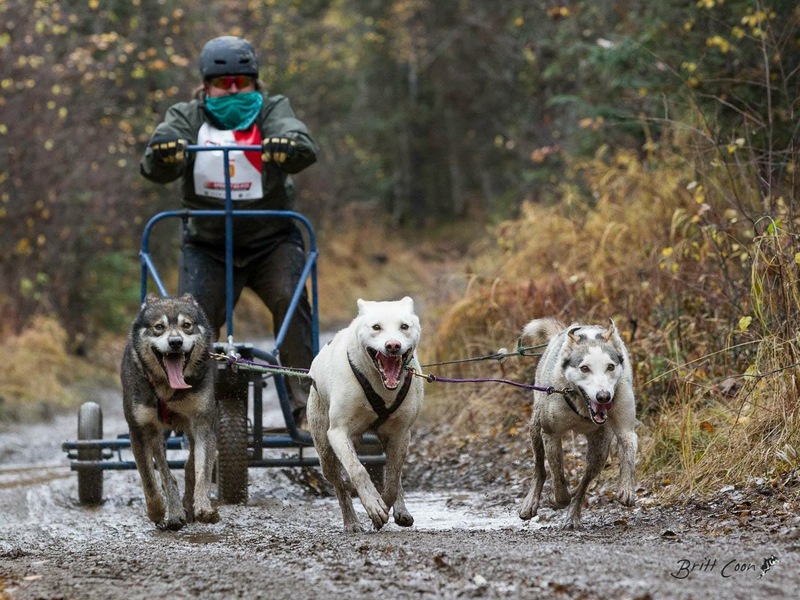 To me that is what mushing is about. Hanging out with friends and making new ones learning from each other and sharing experiences. It was great to spend time with Dan, Kim, Dakota, Greg, Zoya, John, and Karen. The future of this sport may well depend on races like this. These smaller, no fuss, no pressure races is what this sport needs. Everyone is not concentrating on running the big races and with the qualifiers filling up in a matter of minutes, races like this could very well save this sport. I encourage every club, lodge, organization to think about putting on races like this in the future.